"Well suited for German, Austrian and Swiss players. " Well suited for German, Austrian and Swiss players. Adler Casino may be geared towards players in Germany, but they will take most bets from anywhere except those countries listed in the restricted countries in their Terms and Conditions. 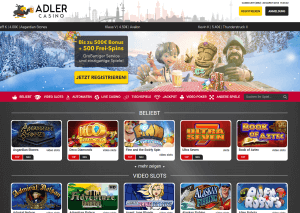 Adler Casino is run by the folks at L & L Europe Ltd – a company that has a portfolio of niche oriented casinos such as All British casino, all Irish casino, No Bonus Casino, Yeti Casino, and a number of northern European focused casinos. 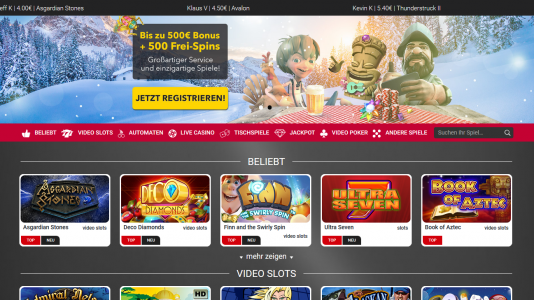 Powered by award winning software supplier… You can play your favorite video slots, table games, live games, jackpot games – nearly everything but decent video poker. If you are into video poker – you should be playing a downloadable Microgaming casino. 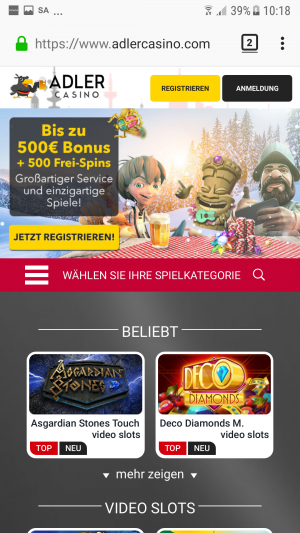 Adler Casino’s website is intuitive – signing up is a breeze – caveat: you’ll need a mobile number to verify your account. This is not a problem for the younger folk, but some of you old geezers may take issue with this. At the moment, the casino is paying out within 24 hours – they have a withdrawal limit of 5000 Euros per day – which is pretty good. That is almost like no withdrawal limit. 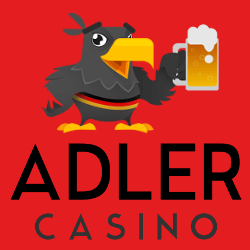 Adler Casino is licensed in the UK and Malta – they share their license with the L&L Europe Ltd. Casino – naturally. Don’t gamble if you are less than 18 years old. Gambling can cause addiction, so gamble responsibly. The casino is well managed and players should not have any foreseeable issues. This is a casino from the L&L portfolio and they seldom generate any complaints.